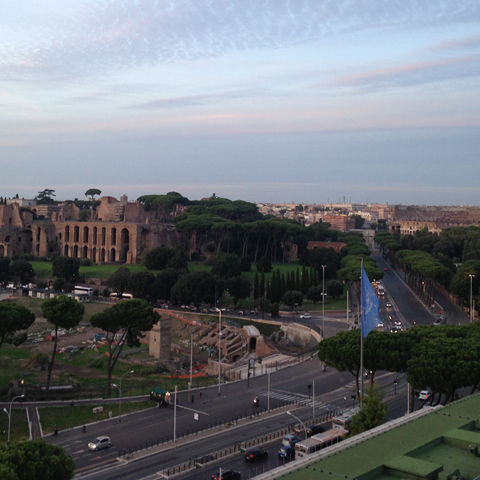 The tenth meeting of the Chemical Review Committee was held from 22 to 24 October 2014 in Rome back to back with the tenth meeting of the Persistent Organic Pollutants Review Committee of the Stockholm Convention. The Chemical Review Committee adopted the draft decision guidance documents on methamidophos and fenthion (ultra low volume (ULV) formulations at or above 640 g active ingredient/L) and forwarded them to the Conference of the Parties for its consideration. The Committee also reviewed the notifications of final regulatory action and concluded that those for polychlorinated naphthalenes submitted by Canada, for short-chained chlorinated paraffins submitted by Norway and Canada, and for tributyltin compounds under the industrial category submitted by Canada met the criteria set out in Annex II to the Convention. The Committee established intersessional drafting groups to prepare draft decision guidance documents on short-chained chlorinated paraffins and tributyltin compounds for consideration at its eleventh meeting. The Committee will take no further action on polychlorinated naphthalenes at the current time as only one notification met the Annex II criteria. Furthermore, the Committee provided comments on the draft guidance to assist parties to the Rotterdam Convention and the Chemical Review Committee in their work when a chemical under consideration is a persistent organic pollutant listed under the Stockholm Convention and requested the joint intersessional working group established at the first joint meeting of the Chemical Review Committee and the Persistent Organic Pollutants Review Committee held in October 2013 to submit it to the Conference of the Parties. The objective of this webinar is to inform Parties to the Rotterdam and Stockholm Conventions, observers and other stakeholders on the outcome of the tenth meetings of the CRC and POPRC. Please register a few days in advance of the webinar. Outcome of the tenth meeting of the CRC - 15 min. Outcome of the tenth meeting of the POPRC - 15 min. Questions and answers – 25 min. The tenth meeting of the Chemical Review Committee (CRC-10) of the Rotterdam Convention took place at the FAO headquarters in Rome, Italy, from 22 to 24 October 2014. The tenth meeting of the CRC included in its agenda the review of new notifications of final regulatory action received from Parties on short-chained chlorinated paraffins, tributyltin compounds and polychlorinated naphthalenes, for inclusion in Annex III to the Rotterdam Convention and the consideration of draft Decision Guidance Documents on methamidophos and fenthion (ultra low volume (ULV) formulations at or above 640 g active ingredient/L), for submission to the seventh meeting of the Conference of the Parties to the Convention, in May 2015. The tenth meeting of the Persistent Organic Pollutants Review Committee (POPRC-10) of the Stockholm Convention was held at the same venue, from 27 to 30 October 2014. During this meeting, the Committee reviewed the draft risk management evaluation on pentachlorophenol and its salts and esters, the draft risk profile on decabromodiphenyl ether, and the proposal for listing dicofol in Annexes A, B, and/or C to the Stockholm Convention and undertook other tasks assigned to it by the Conference of the Parties to the Stockholm Convention. Stockholm and Rotterdam Conventions national focal points, official contact points, designated national authorities, permanent missions and interested stakeholders, POPRC members, CRC members and members of the Basel Convention Small Intersessional Working Group (SIWG) on POPs guidelines. The internet-based software, Webex, will be used for the video/teleconference session which allows sharing voice and data, such as PowerPoint presentations. Webinar participants would need to use the following items: a headset (preferred) a computer, a phone, a microphone, speakers and a good internet connection. The objective of this webinar is to inform Parties to the Rotterdam and Stockholm Conventions, observers and other stakeholders in order to enable their full participation in the work of POPRC and CRC.